Napoleon’s Prestige PRO Series PRO500RSIB proves that cars aren’t the only things that have style and performance in one package. This slick grill looks and performs like its name. Professional. Built from top to bottom with high-quality, high-performance features designed to make every cooking experience not only easy but impressive. Start at the bottom with the new EASY ROLL™ locking casters so you can relocate and position smoothly; sleek soft-closing doors that make a difference every time you open them to access the fully integrated storage shelving illuminated with interior lights; and on the inside of the door we added an extra shelf and a bottle opener for… well why not? Every one needs extra storage and a bottle opener handy at all times. The spacious stainless steel side shelves feature condiment and towel holders and an integrated ice/marinade bucket and cutting board in one side. The other proudly holds the Napoleon exclusive infrared SIZZLE ZONE™ side burner. Next we take you to the cockpit of the grill, the control panel and cooking system. The control panel has been redesigned with exclusive new features sure to impress. The NIGHT LIGHT™ control knobs aren’t just vibrant and cool looking, but they help illuminate the control panel for late night entertaining and they harness the power inside – JETFIRE™ ignition for fast and easy start ups every time. Behold the cooking system. 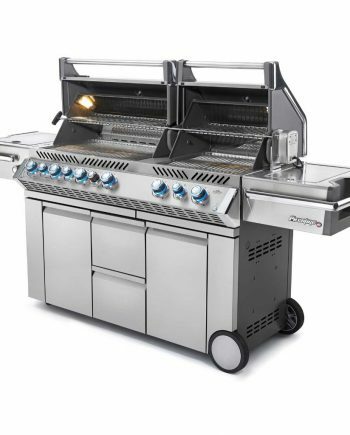 True to Napoleon quality we offer a stainless steel cooking system with the heavy-gauge tube burners with cross over lighting, DUAL-LEVEL sear plates, trademark WAVE™ rod cooking grids, and rear infrared rotisserie burner and warming rack. That’s a whole lot of stainless steel integral to Napoleon quality. We took it up a notch adding two more interior halogen lights to see the delicious meal you’ve been creating. Prestige PRO Series PRO500RSIB gives you a total of six burners. Four bottom tube burners made with 304 stainless steel give you the durability and heat control that Napoleon® is known for. From the pedestal base to, the side shelves and lid with chrome details. 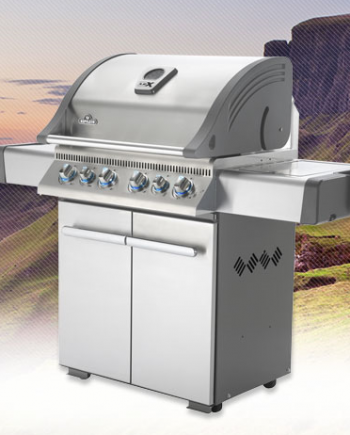 This grill is made of marine-grade 304-stainless steel. Best on the market. Prestige PRO Series PRO500RSIB gives you a total of six burners. Four bottom tube burners made with 304 stainless steel give you the durability and heat control that Napoleon is known for. The infrared SIZZLE ZONE™ side burner heats to 1800°C in seconds. That means searing the perfect, steak house style meal in minutes. The SIZZLE ZONE™ is a piece of ceramic that has thousands of tiny portholes. Gas is forced through these holes and lit. The ceramic grows red hot in seconds, producing infrared heat. Easily lock in the juices and self baste your meals with the rotisserie burner. 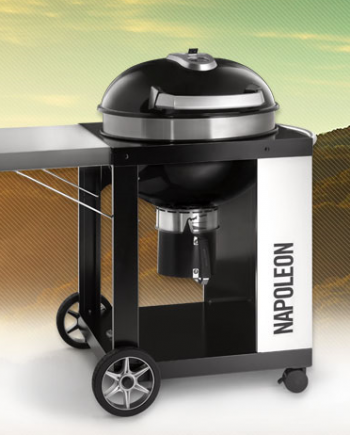 The Napoleon Prestige PRO Series PRO500RSIB Gas Grill is 500 square inches. That’s enough main grilling surface to grill up to 31 burgers! But the fun doesn’t stop there. Optimum heat control is one of the qualities of a Napoleon Grill. You can roast or sear over the main burners with ease. Even bake everything from chicken to cake on your PRO500RSIB. The trick is the double walled lid. It is nearly completely sealed, letting very little heat escape, trapping the heat and circulating it like a conventional oven. You can even use a PRO Series Gas Grill as a smoker, just add soaked wood chips to a stainless steel smoker tube. Turn your gas grill into a charcoal grill with a cast iron charcoal smoker tray too. Just remove the sear plates and place the charcoal tray in. Sear the perfect steak over the infrared side burner, and then finish on the grill. 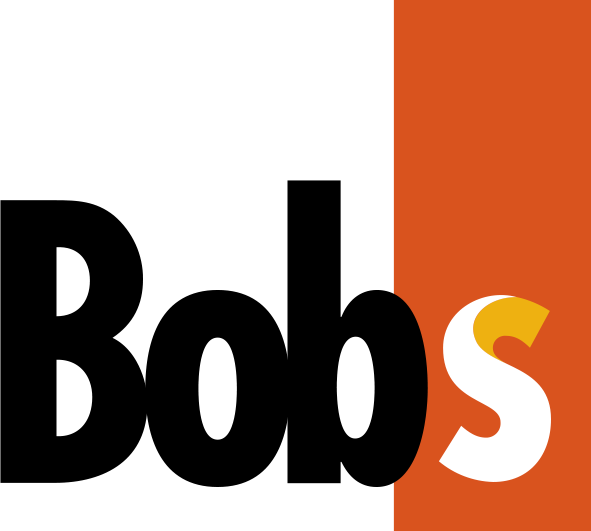 You can also use the infrared SIZZLE ZONE™ for small batch cooking instead of using the main tube burners on your grill, and even as a burner to make sauces or sauté over while grilling the main dish. 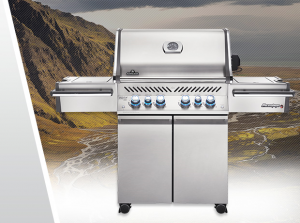 For versatility, reliability and style, nothing beats a Napoleon Prestige PRO Series PRO500RSIB Gas Grill. 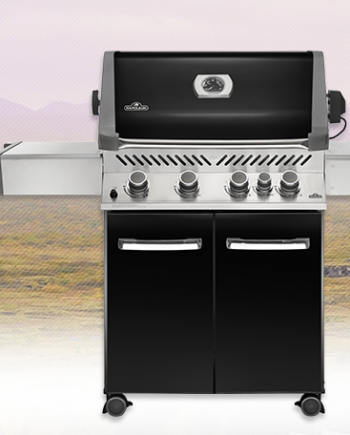 It has all the features of the best grills and comes in a stylish and sleek package. The stainless steel construction of a PRO500RSIB Grill means that it will last for ages and look good doing it. The surface wipes down easily. Inside a full width drip pan directs any grease to the included drip tray with disposable insert. But you won’t need that very often because the seven staggered sear plates provide increased surface area for vaporization of grease, with nowhere for the grease to build up. They simply clean with hot soapy water. Stay organized with the condiment basket, drink holders and towel bar. The PRO500RSIB Gas Grill proves that style and performance is not just for cars any more.